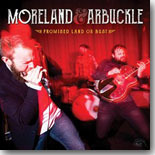 Moreland & Arbuckle earn a Pick Hit with their debut disc for Alligator Records, Promised Land or Bust. This month's Surprise pick features a self-released CD, My Blue Soul, by outstanding Bay Area singer Terrie Odabi. Our Flashback feature, The Arson's Match, takes a different twist this month, containing new live recordings from guitarist Peter Karp with material that was previously recorded but never before released. Our What's New section features reviews of new CDs from John Primer, Big Harp George, John Long, Mighty Mojo Prophets, Eric Bibb, Paul Reddick, Alabama Mike, Jordan Patterson, The Bo-Keys, and more. Check out Tim Holek's visit to the Chicago Blues Festival and interview with Alligator Records head Bruce Iglauer in this special Blues Bytes report. All contents Copyright © 2016, Blue Night Productions. All rights reserved.